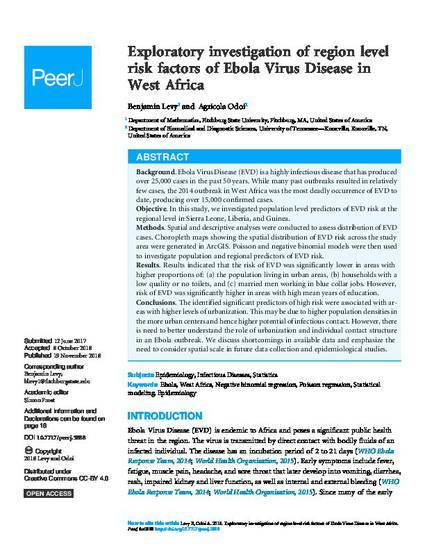 Exploratory investigation of region level risk factors of Ebola Virus Disease in West Africa. Ebola Virus Disease (EVD) is a highly infectious disease that has produced over 25,000 cases in the past 50 years. While many past outbreaks resulted in relatively few cases, the 2014 outbreak in West Africa was the most deadly occurrence of EVD to date, producing over 15,000 confirmed cases. In this study, we investigated population level predictors of EVD risk at the regional level in Sierra Leone, Liberia, and Guinea. Spatial and descriptive analyses were conducted to assess distribution of EVD cases. Choropleth maps showing the spatial distribution of EVD risk across the study area were generated in ArcGIS. Poisson and negative binomial models were then used to investigate population and regional predictors of EVD risk. Results indicated that the risk of EVD was significantly lower in areas with higher proportions of: (a) the population living in urban areas, (b) households with a low quality or no toilets, and (c) married men working in blue collar jobs. However, risk of EVD was significantly higher in areas with high mean years of education. The identified significant predictors of high risk were associated with areas with higher levels of urbanization. This may be due to higher population densities in the more urban centers and hence higher potential of infectious contact. However, there is need to better understand the role of urbanization and individual contact structure in an Ebola outbreak. We discuss shortcomings in available data and emphasize the need to consider spatial scale in future data collection and epidemiological studies.